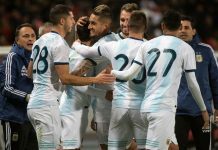 Interim Argentina coach Lionel SCALONI has tried out a different line-up in training ahead of Argentina’s match against Guatemala on Friday. RULLI; SARAVIA, FRANCO, FUNES MORI, TAGLIAFICO; LO CELSO, BATTAGLIA, PALACIOS; PAVON, SIMEONE, MARTINEZ. The eleven isn’t confirmed and SCALONI is still trying out different players but that front three of PAVON, SIMEONE and Gonzalo MARTINEZ looks set to start against Guatemala. Since we are beginning a new cycle the first thing we all have to have is patience. Please put up with the young guys as they will carry the torch for the next 10 years . We might get a careworn win versus Guatemala and might go down against Colombia. Then Please don’t heave the trigger and thrust aside the boys. It will take at least 5-6 games to form a team first. After the first purpose is achieved( forming a team) then we can start to think of becoming cutthroat. 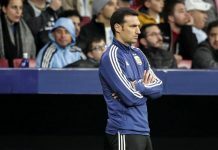 I also want Scaloni in the chair till Copa which will provide him the composure he wants to rebuild and that will also settle the ambiguity among the boys. Secondly, Tapia is aiming high. He always did that since resuming office in 2017. Back then the most wanted coaches were Gallardo, Pocchetino, Simione and Sampaoli in random order. He chose Sampaoli. Presently, the top 3 that are being craved for is Simione, Pocchetino, Gallardo. Tapia had the options (and chance) to sign Garceea, Almeyda. Even today he has a chance to sign Almiron or Peckerman as both of them are “Free”. But it’s not happening which gives an indication that he is targeting one among the top 3 mentioned above. However, Tata Martino has suddenly popped up. But I don’t think he will accept given his past familiarity with AFA. Lastly, I agree with @Mik that AFA needs to formulate the project ASAP . Further, CONMEBOL and CONCACAF jointly should start something similar to UEFA Nations League (if possible) so that this friendlies can become more significant. 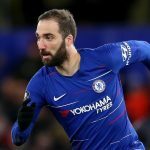 Apparently those Europeans wont play in Friendlies anymore (A decision which is Correct, no one is interested in Playing Friendlies Nor watching it, So why wasting time and effort, Use it wisely, that’s exactly what happened, This at least gives the players a more greater reason to perform for the NT) They r starting the league of nations football. They r rich they analyze and plan everything to inch perfect, They study opponents on every nukes and corners. Soon Every European country football nation will soon end up like Germany , Belgium, France, Spain etc. A LONG TERM PROJECT WITH CONTINUITY. And here we r AFA is doing so many sittings and discussions for nearly3 months since the WC, Still no project or structure. I Know its difficult for a South American country to plan same goes to African and Some Asian Nations(Not every nation Japan ad Korea obviously r great in planning, If i m not wrong China has already started a Long term Football Project). Soon there will be a time that World Cups wont be won out side any European country. I Hope i don’t happen ever like that. If we don’t act now we r ourselves risking of going so many steps backwards(As we already r now) In Brazil and Argentina especially the Talents will born again and again. That’s the only area those Europeans will fall behind. We have to manage that talents, That will be possible only by a Complete structure or project with a Calm headed Coach at the Top. Ironically these Football project ideology originated in Argentina. Menotti had one, Pekerman revitalized it. Now it all turned around vice versa. I think AFA r not so keen on Pekerman i guess nor on Scaloni to continue. They r still looking for Simeone, Pochettino or Gallardo. A waiting game which is okay if they don’t end up on some one like TATA MARTINO. Sorry long post. Its rather obnoxious(LOL where did i get that word) to read long posts. Dont care much about starting 11 against Guatemala…but would love to see following line up against Colombia. I don’t understand Dybala case yet? What’s wrong with this kid!? Icardi & Martinez both injured & out. Don’t he feel the importance of his presence in national team? Ronaldo came & bench him in Juve. 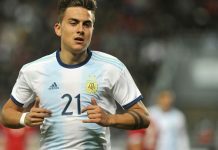 This guy will end up become another waste talent of Argentina. Btw, Happy to see Tagliafico as captain. Hope he lead the back & the whole team the way he did in Independente. A.Correa & Simeone partnership will be great imo. They have done it before with Los Pibes. Can’t wait to see the new Argentina matches!! Height is the factor which concern me the most. Guatemala and even Colombia(it’s a friendly) doesn’t matter. I mean there is only 3 guys (Outfield players) who are above 1.8m. I know Tagliafico is good in heading, so is Simeone. But come on it’s no secret that we struggle against physically imposing tall players(read European). So what I want is integrating players with height to the team. I know that it is more easy to say than do. But we need a plan, a real plan whick focuses on most of the common deficiencies. Battaglia (1.87m) – The only DM with height for us. Hope he stays with us. It’s the reason I want to see him over Ascacibar. 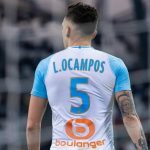 Lo celso (1.77m) – You can’t ask a creative player to be tall, still hope he improves his phisique and ability on the air to become a more complete player. Pavon (1.67m) – Pace and height normally dont combine together. Height cannot be taken to account for this position. Pity martinez (1.72m) – Normally you don’t expect your winger to be tall. So his short height is acceptable. But my question is ‘Should we use 2 short men on wings?’. Wouldn’t it be better if one winger is tall with some aerial ability? Pavon is taller than 1,67 for sure. Tagliafico very good in the air despite his height. From my perspective of this new Argentine team i would like to impart my realistic expectations during these 2 matches. Let me know if you guys agree or not kay. From the players and especially midfielders that Scaloni selected expect them to play a very very high pressing game, they are all full of energy, tenacious and fairly good at tackling as compared to our dull and old ex central midfielders. Expect them to ALL defend high when they lose the ball. I’m realistically expecting them to commit a lot of fouls too. They will surely release the ball quickly (which i’ll be more than glad to see ), even Scaloni had highlighted this weakness in our previous team and has pledged to rectify this. Our defenders as they are inexperienced and have never played together, expect them to do a lot of errors ( even schoolboy ones) in the initial stages of the games. The onus is on Scaloni now to find the best pairing as soon as possible, trust and keep them playing for long. I’m glad that they’re all young and will be able to continue long enough to be the entrusted defenders for us even till the upcoming wc. What i’m really worried of is the lack of a genuine playmaker in this squad. The player who has the composure to plan, create and calm the team when the team is down and needs to get a goal back. Who are we going to rely upon to make the players work together when they’re all aimless looking and are erratic at the centre. I really hope Scaloni has a plan for who will really be in charge of the team on the field although personally i don’t see one yet. Mori? Crapp. 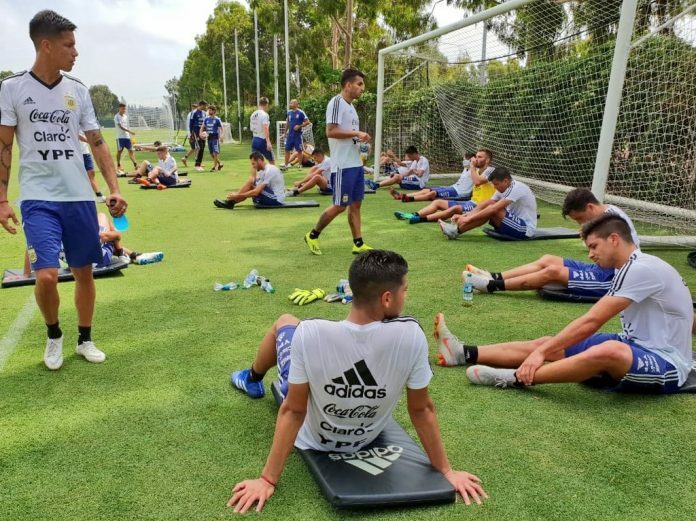 I like the first 11, Pezzella and Tagliafico should get more playing time as those 2 r gonna be pillars of the future backline, RB spot is open bustos or placido or Saravia or may be gomez r in contention. Battaglia is a destroyer which will give defensive stability but Paredes would have given another dimension with his great range of passing. Moreover Lo celso and Paredes need to play more I think. Paredes is good in corners and free kicks too. Palacios may surprise us with his energy I guess. Agree.. especially we need paredas. He is proper deep lying playmaker. Can spray the passes short and long ranges. This funes mori I don’t trust him. Pezzela is very good defender. Who is a better overal player Gio Simeone or Alario? One thing already notice about scaloni is . What happened to dybala all of a sudden , why he is not on the team ? Plz somebody respond.